Canada arrived, chequebook in hand, for this week’s United Nations ministerial peacekeeping conference in New York — a meeting which may have demonstrated to the Trudeau government that money cannot buy happiness. It was an understated, low-key performance that included a subtle pitch for a Canadian to sit at the UN Security Council table, starting in 2021. Compared to the star-studded extravaganza of the last high-level meeting in Vancouver in November 2017, this get-together of peacekeeping nations seemed more businesslike. Foreign Affairs Minister Chrystia Freeland put $15 million on the table for one of the signature items from the previous conference, the Elsie Initiative, which aims to increase the involvement of women in peacekeeping. She also poured cold water on the notion that Canada would extend its deployment of helicopters to Mali until replacements had arrived. The cash was part of an overall $45 million package that the Liberal government says is “new money” for a cross-section of UN programs. Defence Minister Harjit Sajjan was keen on Friday to highlight the Mali deployment, the one major UN mission the Liberals have delivered out of a long list of commitments. “Canada quickly responded to the UN’s request for aviation capabilities with our deployment to the UN mission in Mali,” Sajjan told delegates in his speech. Sajjan’s choice of the word “quickly” might be up for debate. While UN allies were pleased with Canada’s swift move to get into the field once the decision was made in March 2018, there was consternation for two years prior to that. 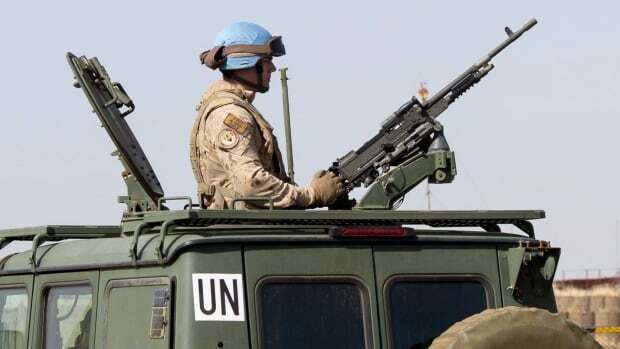 Internal Department of National Defence documents, obtained by CBC News under access to information, show the UN repeatedly asked Canada to deploy helicopters to Mali and was initially rebuffed in August 2016. In his speech, Sajjan was silent on the UN’s plea for Canada to keep its helicopters and medical personnel in the city of Gao until the fall, when a contingent from Romania can relieve them. Both Canada and Germany were instrumental in recruiting the Romanians. CBC News reported Friday that the Liberal government, which missed a previous deadline to respond to the request, had asked for two more weeks to consider an extension to the planned shutdown of air operations on July 31. Freeland, speaking to reporters in a conference call Friday afternoon, said an extension was not going to be granted. “We said that we would be in Mali for a year, and that’s a commitment that we will keep,” she said. Walter Dorn, a professor of defence studies at the Royal Military College of Canada, said he’s mystified by how immovable the government has been on the timing of the pullout. Leaving without replacements on the ground not only irritates the UN, it means that the number of Canadian peacekeepers in the field would drop to a new all-time low just the Liberals hit the campaign trail in late summer, he said. “The optics wouldn’t look great,” said Dorn, who noted the Trudeau government promised a wholesale return to peacekeeping in the last election. There is no sign of a delivery date for the other so-called ‘smart’ peacekeeping pledges, including the deployment of a 200-soldier rapid reaction force and a contingent to train and mentor other nations with less operational experience.